For the first time, NASA astronauts are practicing a launch into space aboard the agency's Orion spacecraft, and provided feedback on the new capsule's cockpit design. 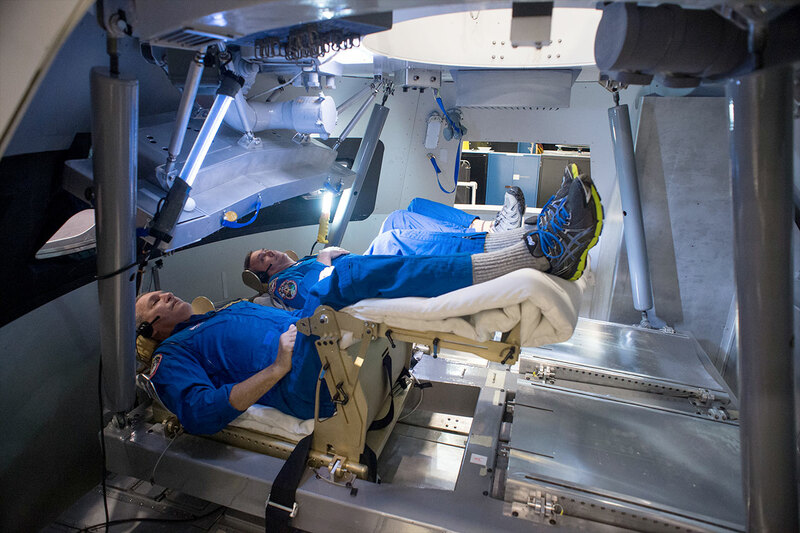 In the ascent simulations, which took place over the course of two weeks at NASA's Johnson Space Center in Houston this month, astronauts rehearsed their roles during an eight-minute climb into space aboard Orion. The rehearsals included procedures that would be required in the event of an emergency with the agency's new heavy-lift Space Launch System rocket, which is being designed to will carry Orion to low-Earth orbit on the first portion of its flights to deep space. Above: Astronauts Rick Linnehan and Mike Foreman try out a prototype display and control system inside an Orion spacecraft mockup at NASA’s Johnson Space Center in Houston during the first ascent and abort simulations for the program. Ten pairs of astronauts participated in two normal launch simulations and two launch-abort simulations inside an Orion mockup fitted with instrument panels and other equipment being designed for the actual capsule. As the two-person crews made their way through a series of tasks, engineers took careful notes of every comment and question from the crew. Their feedback will be considered in the process of fine-tuning the design and build requirements for the displays and controls. "Simulations like these provide valuable experience by giving astronauts and the operations team an early look at what going to deep space in Orion will be like," said astronaut Lee Morin, who has been working on the Orion displays as supervisor of Johnson's rapid prototyping laboratory. "Rehearsing launch and ascent -- two of the most challenging parts of Orion's mission -- also gives us an opportunity to work toward optimizing how the crew interacts with the spacecraft." Designing a spacecraft's cockpit to maximize simplicity and efficiency is not easy. Each of NASA's space shuttles had 10 display screens, more than 1,200 switches, dials and gauges, and pages of procedures weighing hundreds of pounds on paper. By comparison, Orion, which is designed for deep-space exploration and autonomous or piloted rendezvous and docking, will have just three computer screens, each the size of a sheet of paper, which take advantage of information technology advancements made since the space shuttles were designed in the early 1970s. "It's very rewarding work, knowing the displays we are creating and testing now will be what future astronauts will be looking at as they rendezvous with an asteroid, orbit the moon, and even travel to Mars," Morin said. "Getting this right is key to making Orion and other future vehicles safer and easier to use." Orion's first crewed launch, Exploration Mission-2, is scheduled for 2021, when NASA plans to send two astronauts to an asteroid in lunar orbit. Orion ultimately will allow us to go farther into space than ever before, including destinations such as Mars. NASA plans to make Orion's data and software available to the agency's commercial partners, who may adapt it for use in spacecraft that could transport astronauts to and from the International Space Station.